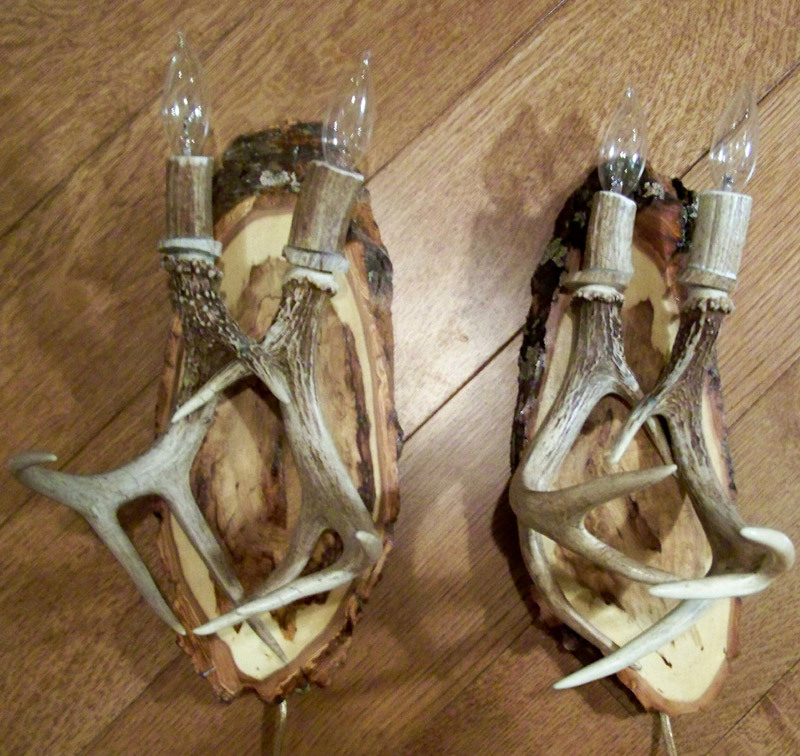 Pair of Whitetail Wall Sconces with four whitetail antler sheds and four lights. Leviton sockets are wrapped with real antler and rated at 75 watts. All wiring is internal and concealed within the antler. Comes with 8 foot of cord and wall plug. Wire can be cut for direct wall installation. 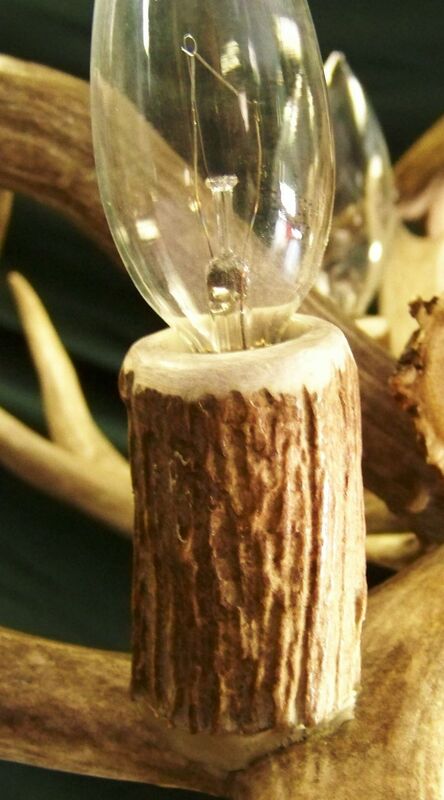 Each antler sconce creation is unique. 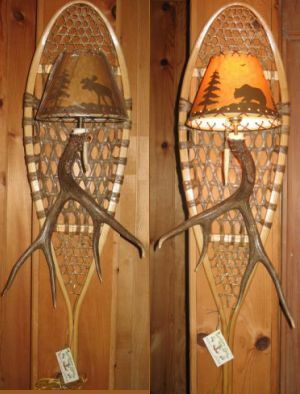 This pair of Whitetail Antler Sconces with four antler sheds and four lights makes a striking accent piece for cabin, lodge, or rustic decor. This unique antler piece brings nature to your cabin, lodge or rustic decor in a beautiful rustic way. Two Antler Wall Sconce is handcrafted with two Whitetail Antler Sheds set on Michigan Black Popular cured two years and finished with polyurethane. Socket is wrapped with real antler and is rated at 75 watts. All wiring is internal and concealed within the antler. Lamp shade is included. Matching pairs are available. Each antler wall sconce is custom made. 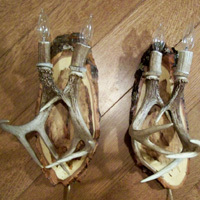 Due to the unique character of real antlers, each antler wall sconce varies. This Two Antler Wall Sconce measures approximately 23″ high x 13″ wide and makes a great accent piece for cabin, lodge, or rustic decor. This unique piece brings nature to your cabin, lodge or rustic decor in a beautiful rustic way. 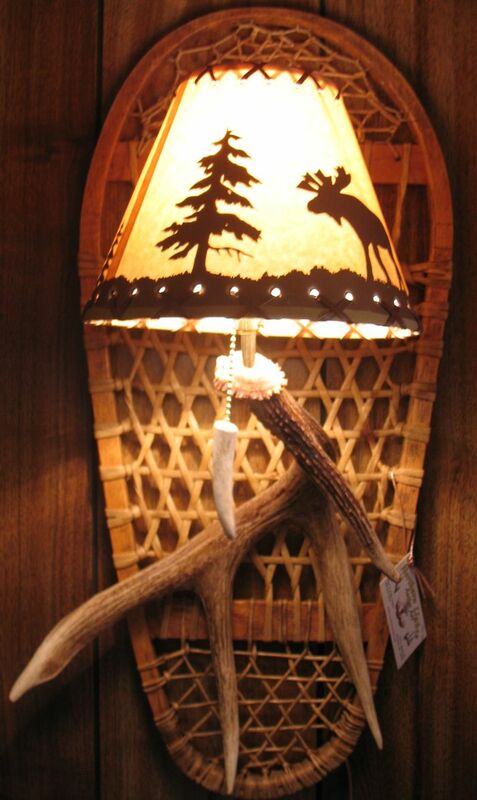 This single Bear Paw Snowshoe Sconce with a large beautiful whitetail shed antler measures 30 inches x 14 inches. An antler tip pull chain adds to the rustic look. Available in right or left mounted. Shade is not included. 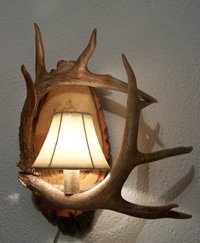 Each antler sconce creation is unique. 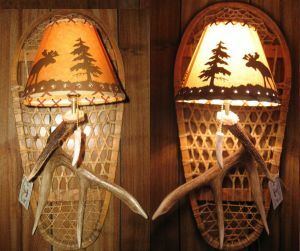 This Bear Paw Snowshoe Sconce makes a striking accent piece for cabin, lodge, or rustic decor. This unique antler piece brings nature to your cabin, lodge or rustic decor in a beautiful rustic way.